I am back at work after a three-week break. I had a good holiday, visiting Manila and Singapore. I really managed to switch off, totally ignoring the temptation to look at my email or Twitter. The part of my brain that is concerned with ‘work’ went right to sleep. But the holiday is finished now and as each day passes I am more focused – my work brain is slowly waking up, and the memories of my holiday are fading. This post is the holiday’s last gasp. 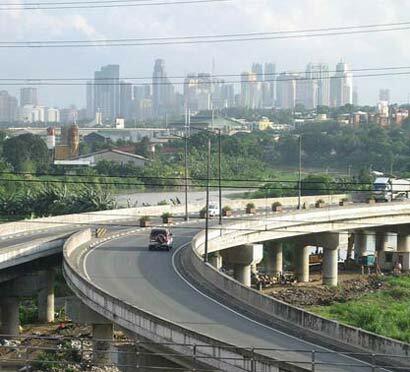 Part of the Manila skyline, plus freeway. We stayed in Manila, the Philippines, for two weeks. On previous trips to Manila we have tried various hotels, but this time we rented a small apartment on the edge of town in a district called Marikina City. You may have seen pictures of the appalling flood in 2009 that devastated Marikina. Today the town seems to have recovered and one would hardly know it had suffered so much. 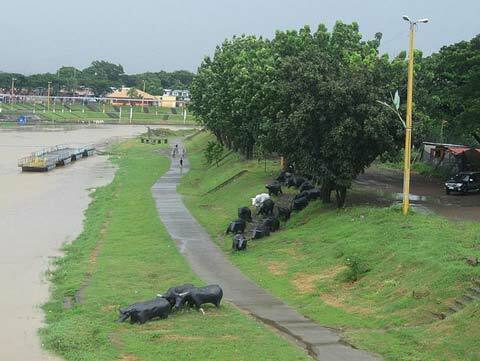 The carabao by the Marikina river. Marikina is also famous as the shoe capital of the Philippines, having had a shoe industry since 1887. 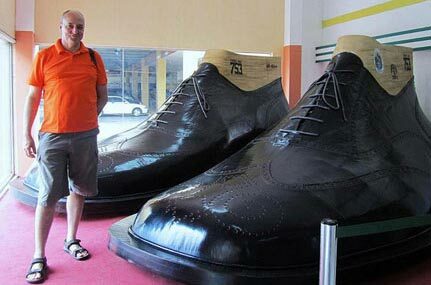 In various locations – including some floating on the river – there are outsize shoes on show. The city boasts a Footwear Museum to boot. Marikina has a reputation as one the country’s cleanest cities, and has strong green credentials: it has various recycling schemes and has introduced a ban on plastic bags, so stores give out paper bags for your shopping. The city does seem clean, though I think its claim to be a ‘little Singapore’ is a bit of a stretch. 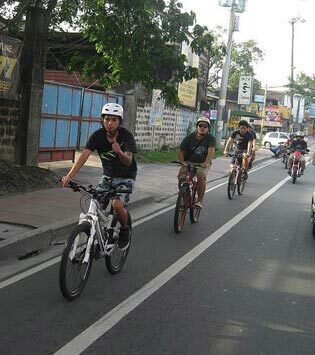 They are also building networks of bicycle lanes and I was assured there are many keen cyclists. Environmentally friendly policies seem to have really caught on in the Philippines. Several cities or districts proclaim their intention to be “green cities”, though sometimes the reality is quite a long way from the intention. Pollution from road vehicles is pretty bad throughout Metro Manila and built-up areas. 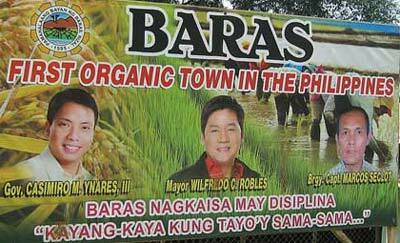 One town I passed through badges itself as an “organic town”. 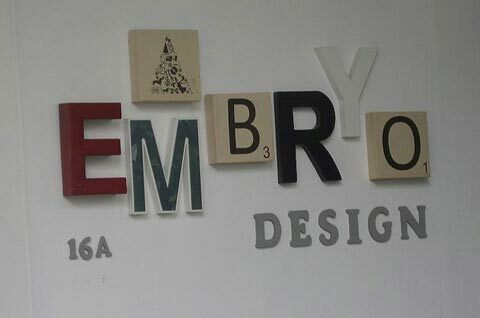 I am not really sure what that means. I saw a number of signs that left me wondering. The English language is widely taught and used in the Philippines, but the idiom is sometimes subtly different. 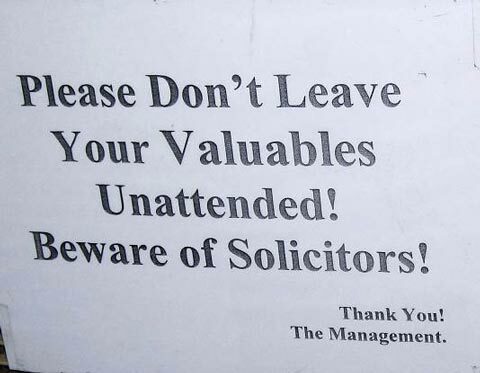 A sign in a cafe. A sign in a petrol station. One sign I saw while walking along a road was a bit alarming. The Philippines is part of the Pacific ring of fire: there are several active volcanoes and earthquakes are not uncommon.but you don’t expect to be reminded of that fact quite so forcibly. 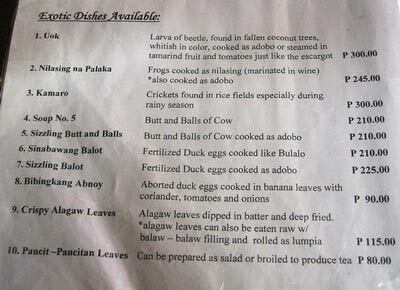 I quite like Filipino food but it can sometimes be challenging. I had heard people talk about “Soup number 5”, usually accompanied by sniggers and broad grins. I wondered what it was – it seemed an odd name for a soup. One day we visited the famous Balaw Balaw restaurant in the town of Angono, about 20 miles from Manila, and my attention was drawn to its page of exotic dishes. There was this famous soup with a rather blunt, if gender-confused, description of the ingredients. Of course we sampled it. I found it to be tasty but a bit greasy. Angono is an interesting town, renowned as the art capital of the Philippines. There are several artists studios, and indeed the above-mentioned restaurant has a gallery attached. Once a year the town holds a fiesta, the Giants Festival, with a procession of ten-foot high paper mâché dolls. 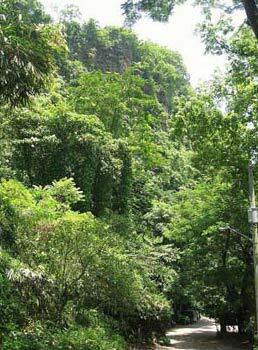 Angono is also the home of the Angono petroglyphs. 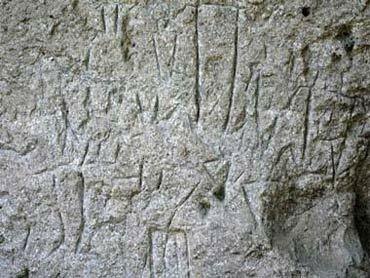 These are 5,000-year-old marks (drawings?) carved into soft volcanic rock. The marks are said to depict people and animals, but they looked like squiggles to me. The Philippines is rich in natural beauty. Away from the cities and towns you can find mountains, rivers, waterfalls, islands, and beaches galore. Guidebooks tend to overlook most of this but you can find out information through the interwebz. 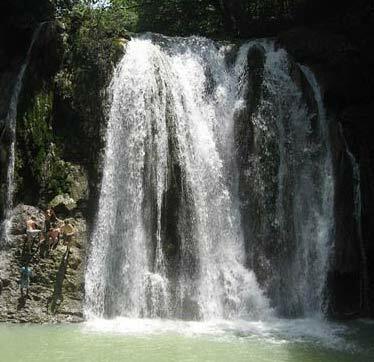 My favourite excursion was one day we went into Rizal province to visit the Palo Alto falls. UInfortunately the park was closed so we couldn’t visit them after all, but half an hour later we made it to the Daranak falls which were pretty good. And the journey through the lush green countryside was a pleasure in itself. The other thing that the country has in abundance is churches – it seems that every town has an old Spanish-era stone-built church, two or three hundred years old. This time I was determined to visit St Joseph’s church on the southern edge of Manila, in Las Piñas. 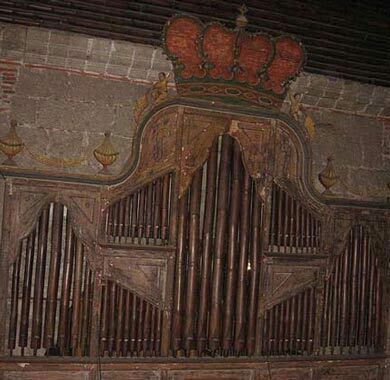 It is famous as the home of the bamboo organ – an organ with pipes made from bamboo. 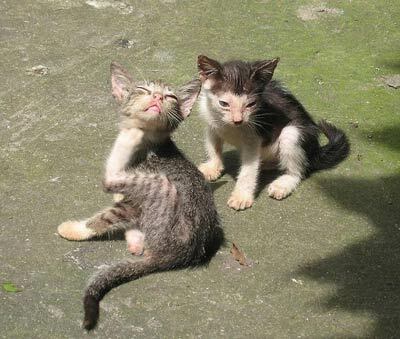 Finally, from Manila, a photo of some kittens. The temperature in Manila was in the low to mid 30s. Moving on to Singapore we found a similar temperature, but a more relaxed vibe. The air was cleaner, the traffic was quieter, there seemed more space and less frenzy than in Manila. 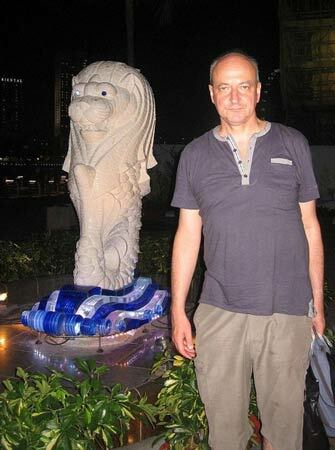 I had visited Singapore before but it was quite a few years ago in 1989. I remember having loved the skyscrapers, particularly this one that was for a short time the tallest building in the world. 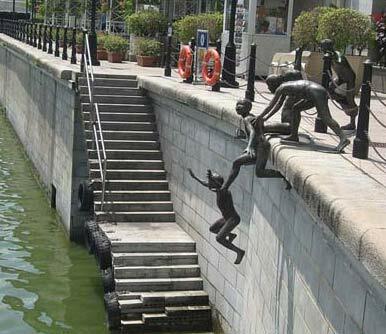 Singapore’s river runs through the main business district and makes an attractive walk, giving space and air to the city. This sculpture reminded me of the carabao sculpture in Marikina (see above). It's so hot you want to jump in to cool off! I was surprised to find that the city has expanded quite a bit. They have reclaimed some land from the sea to create a new quarter where they have built a number of eye-popping buildings in the last two or three years. When I first caught a glimpse of the Marina Bay Sands Hotel I could not believe what I was seeing. Three 57-storey towers are linked at the top by “the world’s largest public cantilevered platform”. 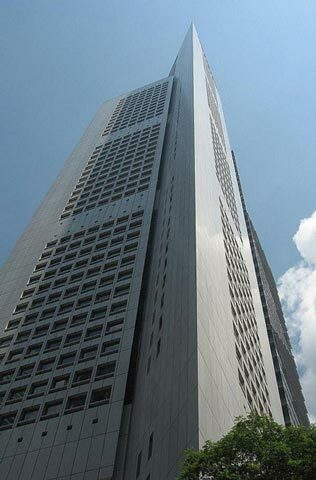 This is the Sky Park – it is 340m long and overhangs the north tower by 67m. It looks scary but you feel compelled to go up there. For a modest charge you can go up and enjoy the view from that overhanging part and look over the edge. 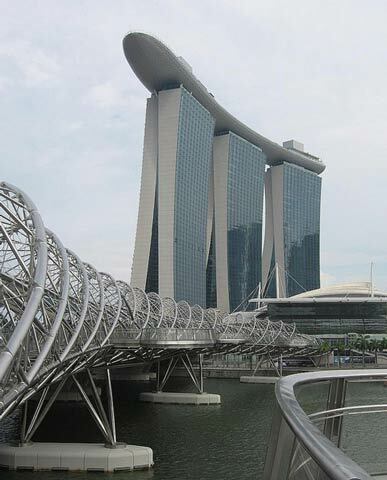 Marina Bay Sands Hotel with its Sky Park on top, and the double helix bridge in the foreground. 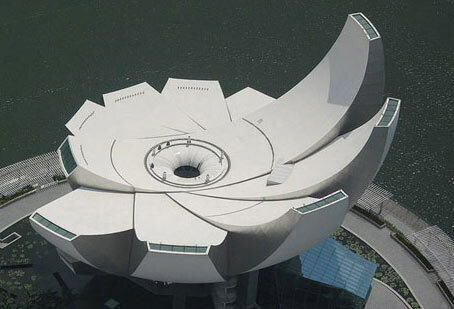 Also in the Marina Bay complex is the very striking ArtScience Museum. I thought it was a great title for a museum so I made a point of visiting but was a little underwhelmed by the contents. The permanent exhibition is quite slight, taking you on a journey through “Curiosity, Inspiration and Expression” by looking at the history of human achievements such as flight. It was all interesting and thought-provoking, but not what I was expecting. There were two temporary exhibitions: one about Harry Potter (which I avoided) and one on Andy Warhol (which I visited). Again, the Warhol exhibition was interesting but not what I was expecting. 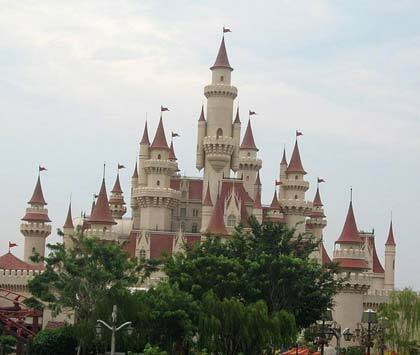 One other thing I was not expecting was a visit to a theme park. Universal Studios Singapore opened in 2010 and has become a must-see attraction. Being a grumpy old man I don’t think I am quite its target audience but I was prevailed upon to go along. 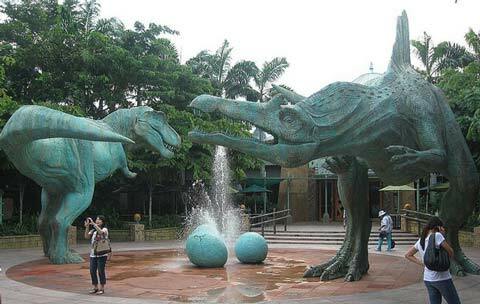 It is not quite as bad as Disneyland – there are at least some semi-grown-up exhibits like Jurassic Park and Ancient Egypt. And I do have a soft spot for Shrek. We went in to see a short film about Shrek that was billed as a 4D film. As well as 3D glasses, the seats all moved to shake you around when the screen showed Shrek travelling on a shaky carriage, and you were sprayed with water when someone on screen sneezed. There was an unpleasant fluttering sensation around the ankles when a large number of spiders were shown scurrying across the screen. It was a laugh. So that was Singapore. I heartily recommend a visit if you enjoy cities and stunning architecture, not to mention good food. We met and had dinner with an old colleague who took us to a branch of Din Tai Fung, which was exquisite. She also gave us a small gift which I was tickled to discover was a packet of tea and a box of biscuits, both from Marks & Spencers! On our last evening we went to True Blue – a restaurant serving Peranakan cuisine which is very delectable. Then we said farewell to the city, visiting the famous Merlion statue. Goodbye Singapore – I will be back! This entry was posted in Froth and tagged Philippines. Bookmark the permalink. I’ve only ever spent one night in Singapore, in transit to Sydney, but we did manage to have a Singapore Sling in the bar at the Raffles Hotel. A friend of mine has been living in Singapore for a while now. She’s what you might call “alternative” – think tons of tattoos and piercings, and a fondness for roller derby and burlesque – and seems to find the rules and regulations a bit much, to say the very least. Looks like a fantastic place to visit though! Austin – I always knew you were a secret member of the jet-setting cocktail crowd! I had a couple of cocktails, but chose Caipirinhas rather than Singapore Slings. Cath – I think you are right; there are restrictions, both legal and cultural, on personal freedoms and that doesn’t suit everyone. These are not so obvious to the tourist on a short stay. It is, though, nice to be somewhere where litter and chewing gum detritus are not much in evidence. I am confused. Why is ‘Soup No. 5’ listed on the menu as No. 4? Dr H. G. of Cromer. I think it’s about something about the distinction between nominal and ordinal numbers. Or it might just be a balls-up.